Tantalisingly, Anonymous describe this as a list of people who attended a meeting with the White Helmets. But there is no evidence of that in the document itself, nor does any other document released so far refer to this meeting. There is very little in the documents released so far about the White Helmets at all. But there is a huge amount about the Skripal case. With the greatest of respect to Anonymous and pending any release of further evidence, I want you to consider whether this might be a document related to the Skripal incident. The list is headed CND gen list 2. CND is Christopher Nigel Donnelly, Director of the Institute for Statecraft and the Integrity Initiative and a very senior career Military Intelligence Officer. The first name on the list caught my eye. Duncan Allan was the young FCO Research Analyst who, as detailed in Murder in Samarkand, appears in my Ambassadorial office in Tashkent, telling me of the FCO staff who had been left in tears by the pressure put on them to sign up to Blair’s dodgy dossier on Iraqi WMD. During the process of clearing the manuscript with the FCO, I was told (though not by him) that he denied having ever said it. It was one of a very few instances where I refused to make the changes requested to the text, because I had no doubt whatsoever of what had been said. If Duncan did lie about having told me, it did his career no harm as he is now Deputy Head of FCO Research Analysts and, most importantly, the FCO’s lead analyst on Russia and the Former Soviet Union. Now let us tie that in with the notorious name further down the list; Pablo Miller, the long-term MI6 handler of Sergei Skripal, who lived in Salisbury with Skripal. Miller is the man who was, within 24 hours of the Skripal attack, protected by a D(SMA) notice banning the media from mentioning him. Here Pablo Miller is actively involved, alongside serving FCO and MOD staff, in a government funded organisation whose avowed intention is to spread disinformation about Russia. The story that Miller is in an inactive retirement is immediately and spectacularly exploded. Now look at another name on this list. Howard Body. Assistant Head of Science Support at Porton Down chemical weapon research laboratory, just six miles away from Salisbury and the Skripal attack, a role he took up in December 2017. He combines this role with Assistant Head of Strategic Analysis at MOD London. “Science Support” at Porton Down is a euphemism for political direction to the scientists – Body has no scientific qualifications. Another element brought into this group is the state broadcaster, through Helen Boaden, the former Head of BBC News and Current Affairs. In all there are six serving MOD staff on the list, all either in Intelligence or in PR. 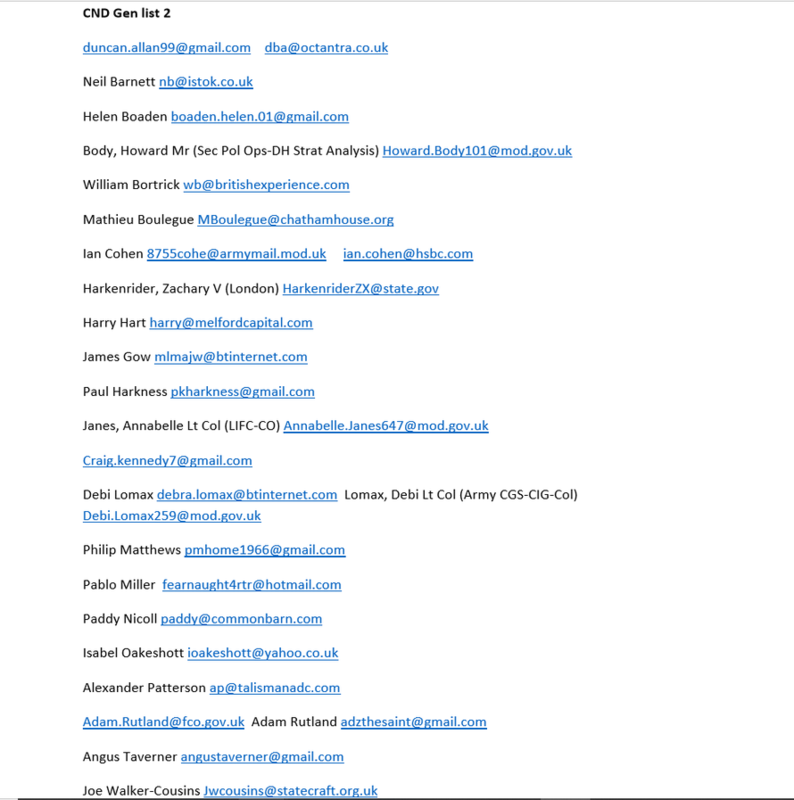 Intriguingly one of them, Ian Cohen, has email addresses both at the MOD and at the notoriously corrupt HSBC bank. The other FCO name besides Duncan Allan, Adam Rutland, is also on the PR side. Zachary Harkenrider is the Political Counsellor at the US Embassy in London. There are normally at least two Political Counsellors at an Embassy this size, one of whom will normally be the CIA Head of Station. I do not know if Harkenrider is CIA but it seems highly likely. 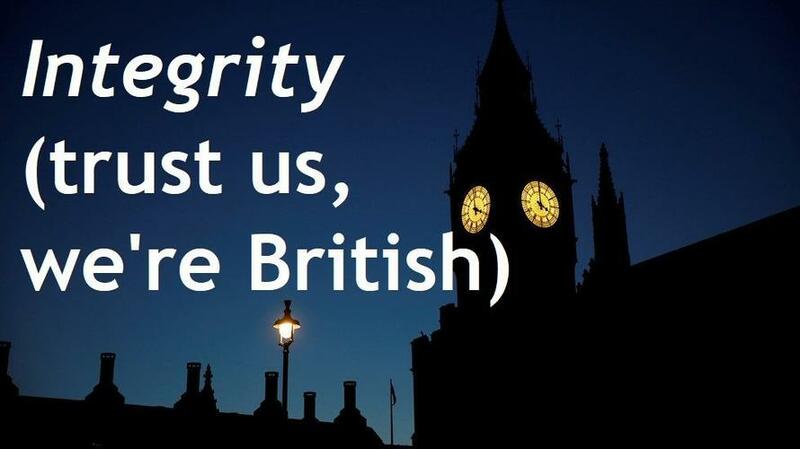 We have a programme, the Integrity Initiative, whose entire purpose is to pump out covert disinformation against Russia, through social media and news stories secretly paid for by the British government. And we have the Skripals’ MI6 handler, the BBC, Porton Down, the FCO, the MOD and the US Embassy, working together in a group under the auspices of the Integrity Initiative. The Skripal Case happened to occur shortly after a massive increase in the Integrity Initiative’s budget and activity, which itself was a small part of a British Government decision to ramp up a major information war against Russia. I find that very interesting indeed. With a hat-tip to members of the Working Group on Syria, Media, and the Propaganda, who are preparing a major and important publication which is imminent. UPDATE Their extremely important briefing note on the Integrity Initiative is now online, prepared to the highest standards of academic discipline. I shall be drawing on and extrapolating from it further next week. Subscriptions to keep Craig's blog going are gratefully received.